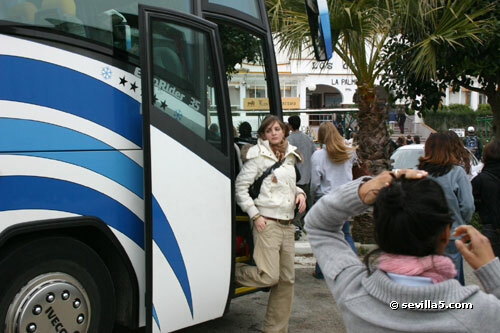 A one-day trip to Gibraltar by bus from Seville. Organized by Solchasers (see contact information below). 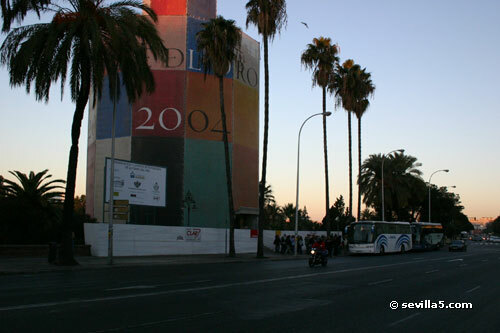 Our meeting point is the Torre del Oro at the Guadalquivir river of Seville, around 9 o'clock in the morning. You can see our two buses parked next to the Golden Tower, which is currently undergoing some reforms. The morning sun is waking us up. There are about 150 participants for this tour. 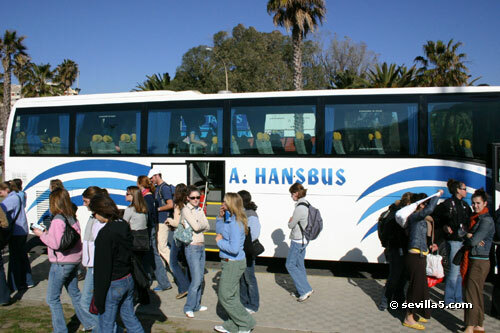 Most of them are students at the University and private Spanish schools in Seville. It's close to a 3 hour drive to Gibraltar. 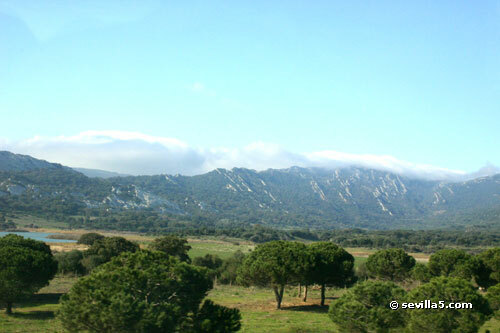 We pass beautiful scenery with cork and olive trees everywhere. This is also the land where the famous Spanish fighting bulls are raised. A coffee break after 2 hours on the road. 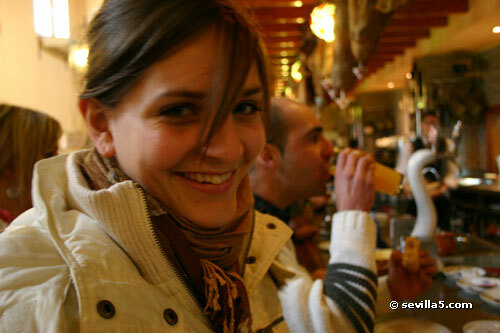 Eliane still looks tired. 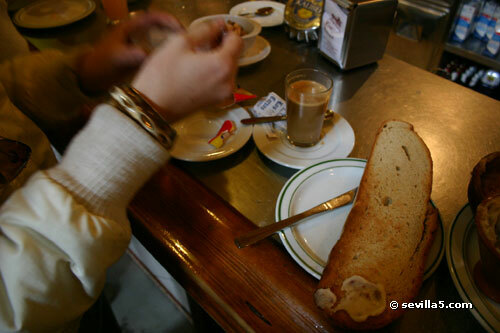 We are having Cola Cao, café con leche, and a large slice of tostada. Although we have not asked for any special topping we receive a shared pot of manteca de lomo blanca. Not healthy, for sure, but surprisingly good. One hour later we arrive in La Linea, which is the Spanish border town just next to Gibraltar. All of the sudden the traffic lights turn red and the barriers go down. 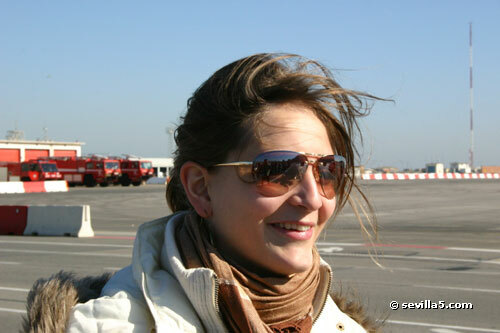 We are asked to hurry up because a plane is preparing for take-off... 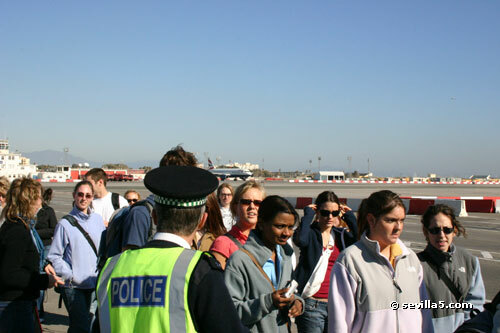 There are 3 scheduled flights per day between London and Gibraltar. Whenever a flight is due, access from Spain is halted as cars and pedestrians are stopped. No Euros on the price sticker! "How can I convert English Pounds into Swiss Francs?" 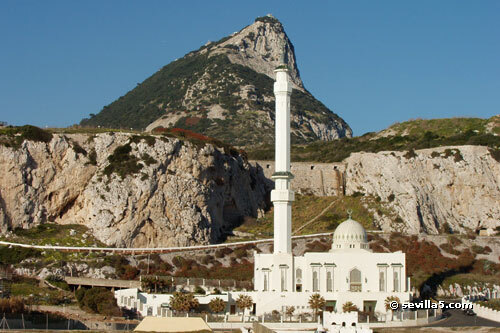 Our Gibraltar tour starts at 2 pm. 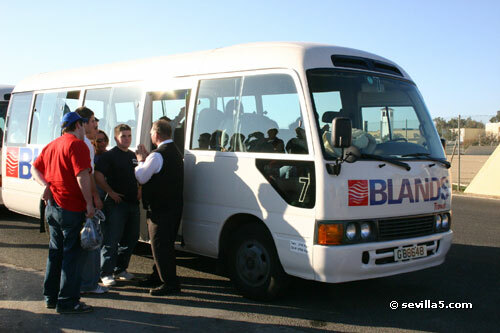 We have to divide the group of 150 people into 5 mini-buses. Paul, our tour guide and bus driver is "very British". He is from England, but now working in Gibraltar and enjoying the lower cost of living across the border in Spain. 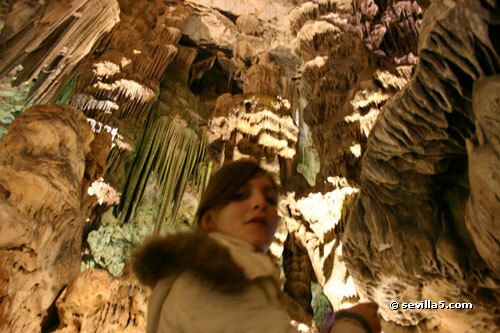 The World War II tunnels through the hollow rock make Eliane feel at home. Just like the Swiss Alps! 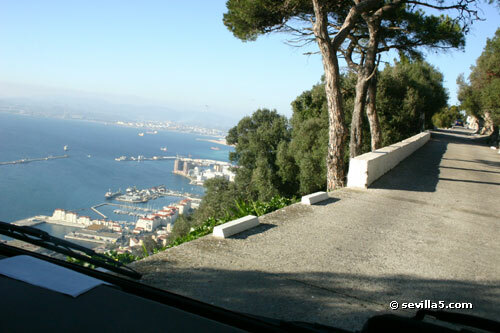 A short break at Europa Point, where we enjoy views over the Strait of Gibraltar to Morocco, on the continent of Africa. 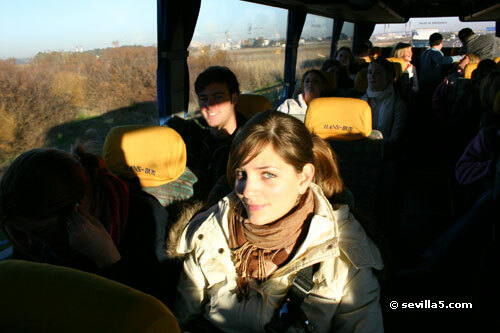 The next part of the tour goes to the Natural Reserve on the socalled "Upper Rock". Here the view from Europa Point, which is the southern edge of Gibraltar. 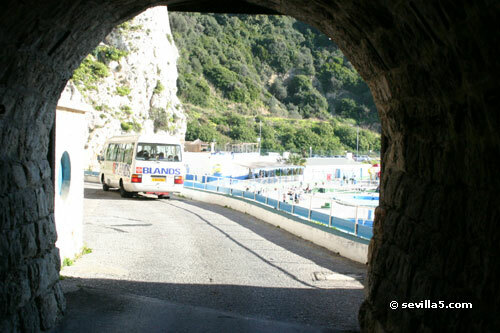 On the narrow streets up the rock we must trust in Paul's driving skills. On the left is what Paul calls the Bay of Gibraltar. For political reasons, the Spanish call the same Bahía de Algeciras. 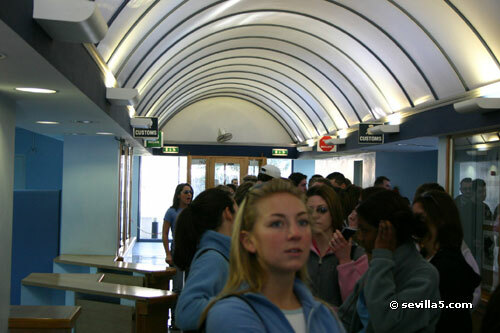 The next stop is St. Michael's Cave where you can see some amazing stalagmite. And still further up to the Ape's Den, where one of the five ape colonies resides. 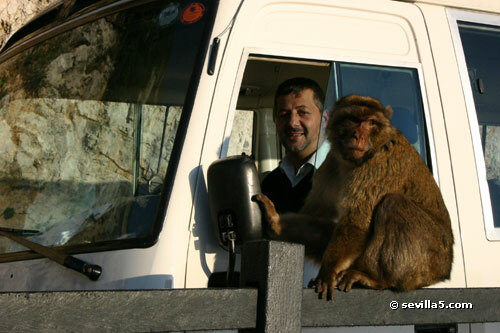 Gibraltar's apes are probably the best known tourist attractions. 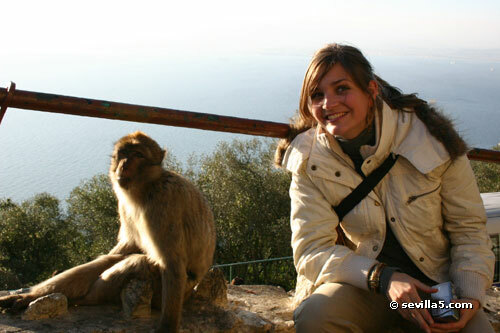 There are around 120 animals living on the rock and are very well cared for by their own veterinarian. A nice 360º view from this point (Apple QuickTime required). This one first played with the horn of one of the buses and then stole a package of potato chips. Another jumped on one person in our tour group.